Guest: Dr. Lou Graham, D.D.S. 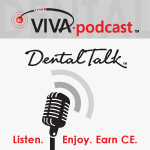 Dental podcast hosted by Dr. Phil Klein: This Viva Podcast will discuss issues related to using various cements with implants and the most important features and characteristics of a quality implant cement. Our guest is Dr. Lou Graham, a well-respected clinician, author and internationally recognized lecturer extensively involved in continuing education for dental professionals. Dr. Graham focuses on incorporating current clinical advancements into a conservative dentistry approach..